The nanoscience and technology (NST) Postdoctoral Fellow Presentation Series is an opportunity at Argonne National Laboratory for postdocs to present their research in order to facilitate networking between postdocs and staff scientists. The best presentation is selected annually through ballots available to anyone who attends a talk. The winner of the 2018 edition was announced at the NST division holiday lunch on December 14, 2018. Dr Matthew Otten has been awarded the 2018 NST Best Postdoctoral Fellow Presentation Award and has received $200 prize sponsored by the Royal Society of Chemistry journal Nanoscale, a high impact international journal that publishes the experimental and theoretical articles across the breadth of nanoscience and nanotechnology. Matt received his bachelor degree from Illinois Institute of Technology and PhD in physics from Cornell. He joined the NST division in the fall of 2017 as a recipient of prestigious Maria Coepper Mayer Fellowship available at Argonne National Laboratory to top science and engineering young talents. Matt is working on the theory and modeling of quantum information and sensing processes in nanoscale systems such as metallic nanostructures interacting with quantum dots the dynamics of NV centers in diamond. 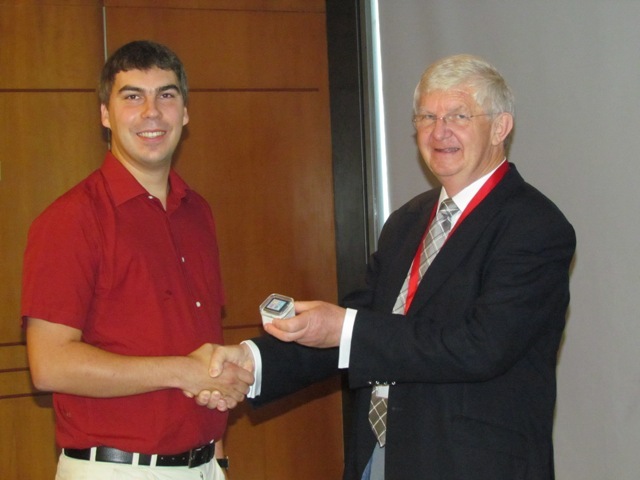 Many congratulations to Maciej Bieniek for winning the Nanoscale prize for the best oral presentation at the PhoBiA Annual Nanophotonics International Conference (PANIC 2015). Maciej, from the Wrocław University of Technology, was chosen by Professors Isabelle Ledoux-Rak, Luana Persano and Robert Luxenhofer to receive the prize for his oral presentation entitled “Two-dimensional topological insulator quantum dots”. 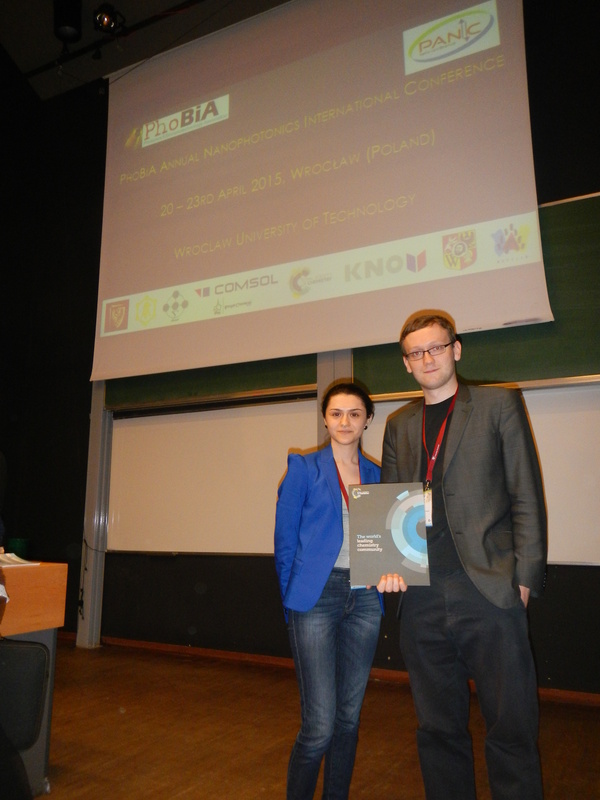 The 6th PhoBiA Annual Nanophotonics International Conference took place from 20th to 23rd April 2015 at Wroclaw University of Technology (Poland). The interdisciplinary conference aims to gather students and young scientists working in the fields of photonics, nanotechnology, biotechnology, materials science and organic electronics in order to enable them to discuss and share their knowledge. The event, organised by students, also featured a number of invited speakers. Further details are available on the conference website. Nanoscale will be awarding more prizes throughout the year – keep an eye out to find out about the winners! 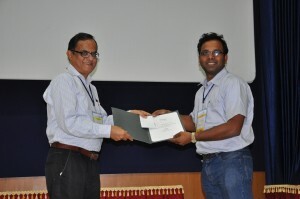 Many congratulations to G. Rajaraman and E. Manikandan for winning the Nanoscale poster prizes at Nano India 2015. G. Rajaraman, from the Indian Institute of Technology, Bombay, won a prize for his poster entitled “New generation molecular nanomagnets”, and E. Manikandan’s poster was entitled “A fingerprint micro Raman spectroscopy study for few layered graphene formation on gold substrate by low energy ion implantation technique”. The prizes were awarded by Professor Ajay K. Sood from the Indian Institute of Science, Bangalore. The conference was hosted by the Centre for Nanotechnology & Advanced Biomaterials (CeNTAB), SASTRA University, Thanjavur, on the 29-30th January 2015. It is a national conference supported by the Department of Science & Technology (DST), and aims to promote the exchange of ideas and create a platform for collaborative research in interdisciplinary areas of nanoscience and nanotechnology. Further details are available on the conference website. 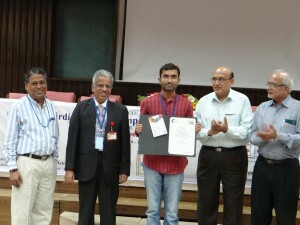 Many congratulations to P. S. Pramod and Nilesh Deshpande from the Department of Chemistry at the Indian Institute of Science Education & Research for winning the Nanoscale poster prize at the International Symposium on Bioorganic Chemistry (ISBOC), with their poster entitled “Dextran Nanovesicles for Loading and delivering Anticancer Drugs”. 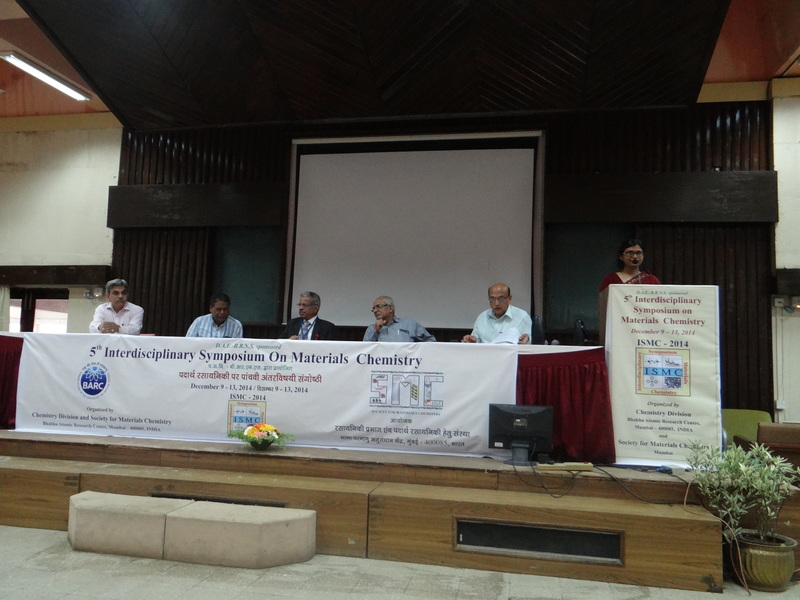 The conference took place at the Indian Institute of Science Education and Research, Pune, India on the 11-15th January 2015 and aims to enhance scientific communication between global investigators in chemical biology as well as promote the development of molecular biosciences and related fields. Dr Yamuna Krishnan, one of Nanoscale‘s Associate Editors, was a member of the Organizing Committee. Further information about the conference can be found on the event website. 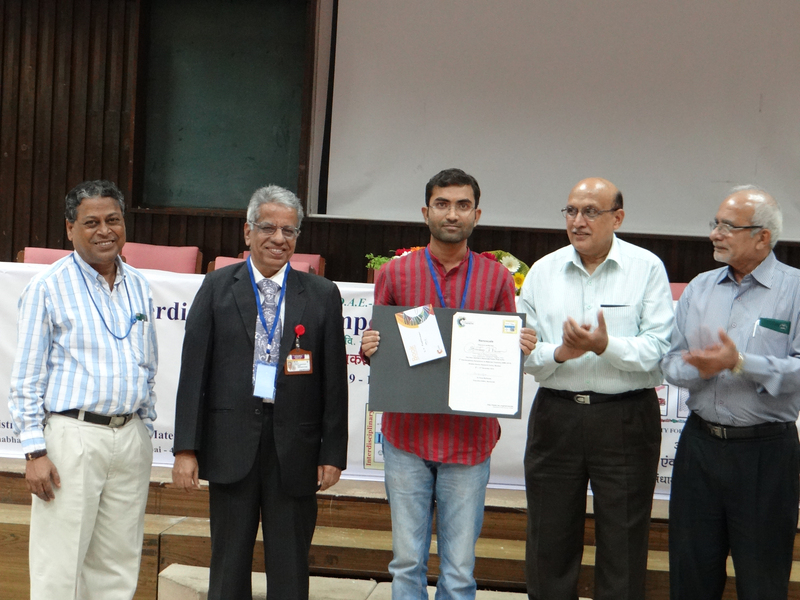 Congratulations to Mr S. J. Pawar from North Maharashtra University and Mr. S. P. Mundinamani from Karnatak University for winning the Nanoscale and Journal of Materials Chemistry A poster prizes, respectively, at the 5th DEA-BRNS Interdisciplinary Symposium on Materials Chemistry (ISMC-2014). Mr Pawar won the Nanoscale prize for his poster entitled “Silver Nanoparticle Based Catalytic Conversion of 4-nitrophenol to Paracetamol in Aqueous Medium”, and Mr Mundinamani’s poster entitled “Supercapacitors Based on CdO Thin Films” won the Journal of Materials Chemistry A poster prize. The conference took place at the Bhabha Atomic Research Centre, Mumbai on the 9-13th December 2014. Further information about the conference can be found on the event website. Congratulations to Richard Archer from the University of Sheffield for winning the Nanoscale and Polymer Chemistry poster prize at the 4th Annual Postgraduate Symposium on Nanotechnology. Richard won the prize for his poster entitled “Nanospinners: Controlling Rotational Frequency in Self-Phoretic Janus Devices”. The symposium took place at the University of Birmingham on the 15th December 2014 and is aimed at giving early career researchers an opportunity to present their research. Further information about the symposium can be found on the event website. 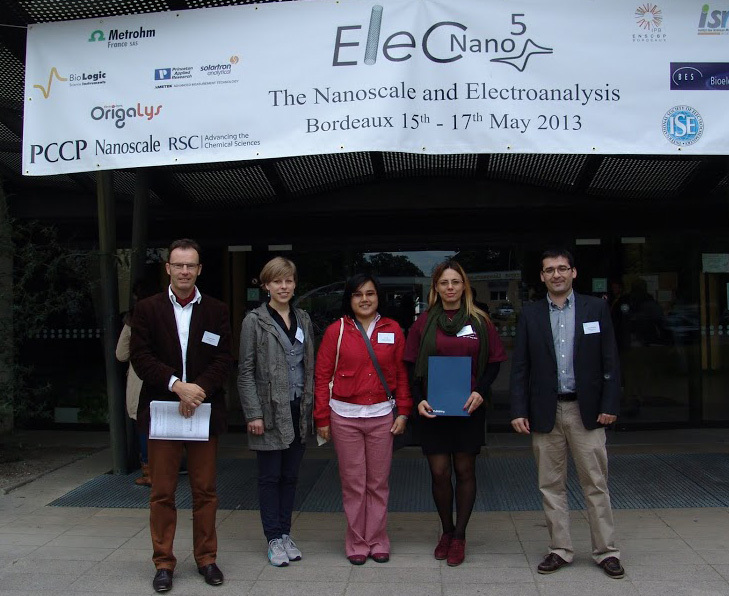 The 5th edition of the international meeting on Nanoelectrochemistry (ElecNano 5) was held in Bordeaux at the ENSCBP Engineering School from 15th to 17th May 2013. This conference is organized biannually by the electrochemistry group of the French Chemical Society (SCF). The 2013 edition gathered participants from 20 different countries and the topic was dedicated to “Electroanalysis and the Nanoscale”. Overall, the program scheduled 42 oral contributions including 4 keynote lectures (Pr. Henry S. White, University of Utah, USA; Pr. Hubert Girault, EPFL Lausanne, Switzerland; Pr. Joseph Wang, UCSD, USA and Pr. Richard J. Nichols, University of Liverpool, UK) as well as a poster session with 46 presentations. 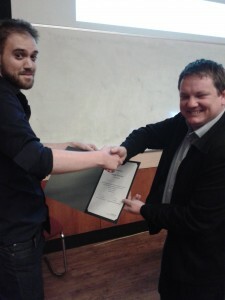 For the first time, poster awards were sponsored by RSC Publishing through the journal Nanoscale. More than 30 candidates were competing for the awards and an independent committee nominated three laureates who won a prize of 100 euros each as well as a RSC certificate. 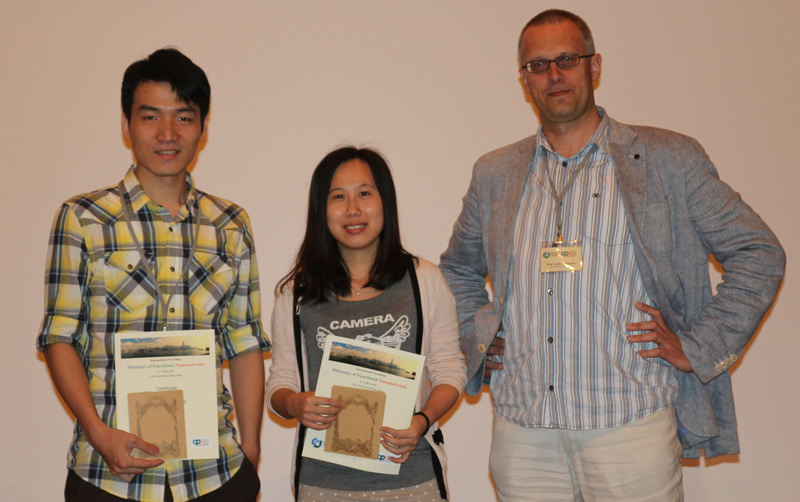 Nanoscale was proud to sponsored poster awards at the International Workshop on Photonics of Functional Nanomaterials, which was held on the 6-9th May 2013 in Hong Kong. 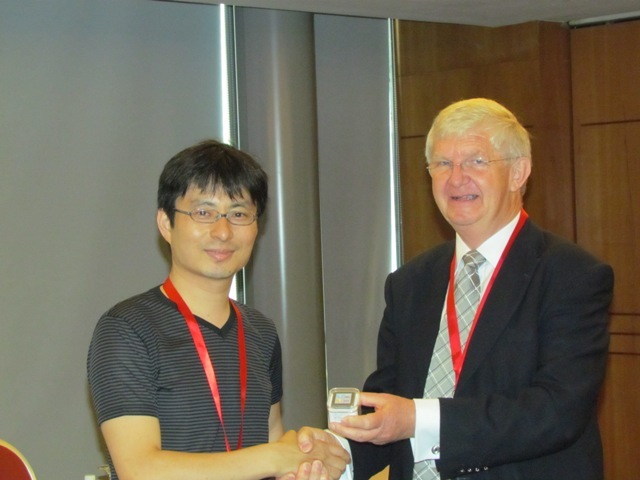 Nanoscale Associate Editor Jianfang Wang was a co-organiser of the workshop. We are thrilled to announce the winners of the Nanoscale Best Speaker Prize at the “China-Singapore Young Chemist Forum”: Dr. Yuangang Zheng (Institute of Materials Research and Engineering, Singapore) and Prof. Hailin Peng (Peking University, China). The Prizes were presented by the Chairs of the two Forums, Prof. Hua Zhang (Singapore) and Prof. Haoli Zhang (China), and were part of the 28th Chinese Chemical Society Congress which was held at Chengdu, China from the 13-16 April 2012. Nanoscale will be awarding further Prizes over the summer so watch this space! We are delighted to announce that two Nanoscale Poster Prizes were awarded at the recent NanoFormulation2011, held in Singapore, 26 June to 1 July 2011, as part of ICMAT. Nanoscale will be awarding further Poster Prizes over the summer so watch this space! Sign-up to the free Nanoscale e-alert and Nanobites Newsletter to read the latest content and news.